She laid there motionless in the ICU bed. The only movement was the regular rise and fall of her chest as the ventilator blows air into her lungs. The only activity in the room was the continued bleep and tracings of the bedside monitors attached to her, indicating that she still has a blood pressure, and a heart beat, for otherwise she really appeared lifeless. As I entered the dimly lit room, I noticed a photo on top of the counter near her bed. It was a photo of a happy family. In it was the patient and her husband, surrounded by their eight children. Yes, eight. That was kind of large family to an American standard, or perhaps anywhere else nowadays. I appreciate families placing photos beside their loved one’s bed. Especially in our patients in the ICU as most of the time we never knew them before they got sick and deteriorated to their current condition now. Somehow the photos gave us an insight to the life, a snapshot if you will, of whom we are taking care of. It humanizes them, at least to us. That they were someone’s mother, or wife, or friend. Or they were once a decorated soldier (as their uniform indicate), or a coach, or a teacher. That they are not mere blob of a body hooked to life-sustaining machines. My patient was in her early fifties. I learned that all the eight children that she have, were all adopted. They ranged from sixteen to eight years of age. That tells me what kind of person I am caring for. A woman with such an enormous heart, with overflowing love to adopt eight kids, and call them her own. Unfortunately, it was also her heart, I am talking now of her anatomic organ, that caused her illness. Few years ago, she needed an open heart surgery to replace one of her heart’s valve, the aortic valve, which was diseased. The aortic valve is the one that opens and closes as the heart pumps out blood from the left ventricle (the main pump chamber) into the aorta (the big artery that distributes blood to the head and the rest of the body). 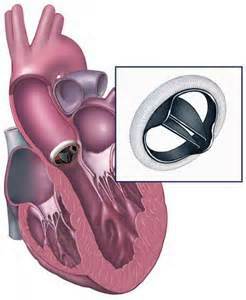 Her aortic valve was replaced with an artificial mechanical valve. A replacement mechanical valve can last for many years, in fact, a lifetime, unlike a tissue valve (usually a pig’s or a bovine’s valve) which only last an average of ten years. However, a mechanical valve increases the risk for forming blood clots, and thus the recipient of those valves requires to be on blood thinners (anti-coagulants) permanently. A few months ago, our patient underwent a necessary outpatient simple surgical procedure that required her anticoagulation to be interrupted briefly. Sadly to say, this caused a catastrophic event. She developed blood clots that led to a very extensive stroke. Our patient really never recovered completely after that. In spite of all the efforts and rehabilitation, she never walked again, she never spoke again, nor she did much of anything anymore. I can just imagine the heartache to her husband and their kids to see her in that state of helplessness. But their family tried to move on. And now this happened. She developed a severe bacterial infection that spread into her blood system. She went into septic shock. This infection caused a bacterial nidus to settle in her mechanical heart valve, a condition called septic endocarditis. The problem with a prosthetic metal valve affected with an infection is, it cannot be treated with antibiotics alone, it needed to be removed or replaced surgically. A surgery that she perhaps cannot survive through, nor can she survive without. As I met with her husband and discussed her grave situation, he softly told me, with tears rolling down his cheeks, that the most loving and humane way of caring for her, was to let her go. I cannot agree with him more. And as we end our talk, he was not the only grown up man with tears in his eyes, for I did too. The children came one by one to her room and they said their final goodbye. It was so painful to watch. After that, the life support was taken off. All the medication drips, except for medication to keep her comfortable, were shut off. After several quiet moments of waiting that seemed like an eternity, her beating heart……the heart that was large enough to adopt such a large family, and the heart with such infectious love to share, and the heart that beat for others…..became still. Very still.